If you like a morning kick from a cup of joe, it’s possible you could be putting the kybosh on prostate cancer. Based on a new study, men who drink more than three cups of coffee per day could slash their risk of developing the disease by half. But before you head to the percolator, there are some very important distinctions to consider. The study looked specifically at Italian men who drank Italian-style coffee like cappuccino, caffè macchiato, and espresso. Italy has a very coffee-rich culture. The way the beloved beverage is prepared there differs very much from how many other cultures take it. It’s a way of life for Italians; the coffee is consumed at breakfast, lunch, and dinner. And it is prepared in a rigorous fashion using high pressure, very high water temperature, and no filters. Basically, it doesn’t come out of a little plastic pod through the common coffee machine most Americans might keep on their kitchen counter. The researchers of the study found that out of the 7,000 Italian male participants, those who drank at least three cups of coffee per day had a 53% lower risk of developing prostate cancer than those who drank less over a four-year follow-up period. So, what makes Italian-style coffee so special? Perhaps the non-filtered preparation method and high heat leave more bioactive compounds intact. But according to the study team, the active ingredient appears to be the caffeine. 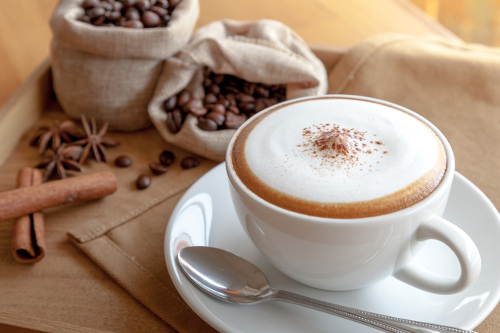 After noting the benefits of coffee to the human population in their study, the researchers looked at the effects of caffeinated and decaffeinated Italian-style coffee on prostate cancer cells in a lab setting. They noticed that caffeinated coffee extracts limited the ability of cancer cells to grow, divide, and spread. The researchers did not observe these benefits with the decaf coffee extracts. Now, you may be saying to yourself, “What the heck? Only a couple of weeks ago I was reading about the potential dangers of caffeine. What gives?” And, that’s an entirely fair question. There are plenty of studies linking caffeine—and specifically coffee—to health benefits like reduced risk of endometrial cancer, breast cancer, erectile dysfunction, and other diseases. On the other hand, there are studies linking it to insomnia, nervousness, restlessness, and upset stomach. And if consumed too quickly or in toxic amounts—over 400 milligrams per day—it could even lead to death. When it comes to caffeine and coffee consumption, individual responsibility is important. Avoid the unhealthier sources of caffeine as much as possible, like soda and energy drinks. If you do drink coffee, make sure you have just one or two cups of coffee at a time. Sip them; don’t slam them back. And I would recommend maxing out at three or four cups total per day. Try to limit the amount of additives you include in your coffee, like sugars and syrups, to keep calories and the risk of insulin resistance down. And, if you have an Italian cafe nearby, maybe you should think about spending a little more time there! Lacoviello, L., et al., “Reduction by coffee consumption of prostate cancer risk: Evidence from the Moli-sani cohort and cellular models,” International Journal of Cancer, April 24, 2017; doi: 10.1002/ijc.30720. Shepherd, R., “Coffee Emerges As Protective Against Cancer And Other Diseases,” Medical News Today, November 23, 2011; http://www.medicalnewstoday.com/articles/238095.php?sr, last accessed May 30, 2017.